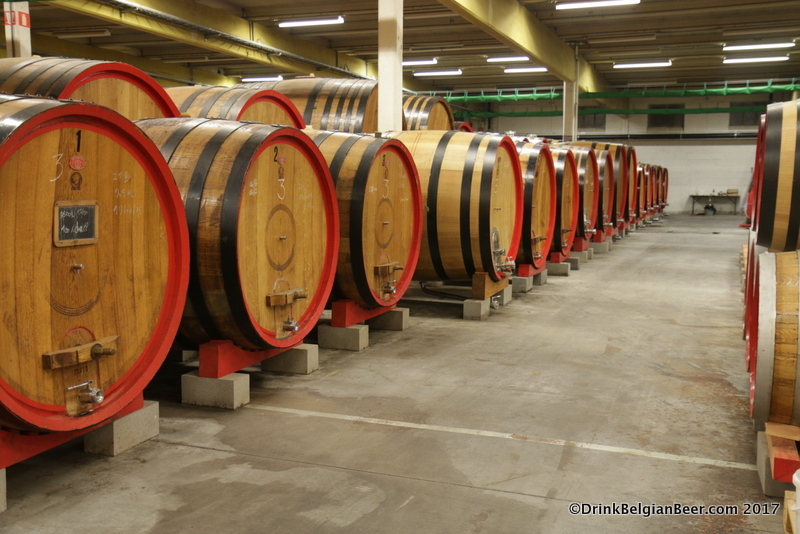 A row of foeders (very large barrels made of oak or chestnut) at lambik-o-droom. 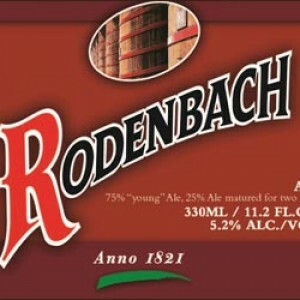 Row of smaller foeders (10 to 20 hectoliters.) 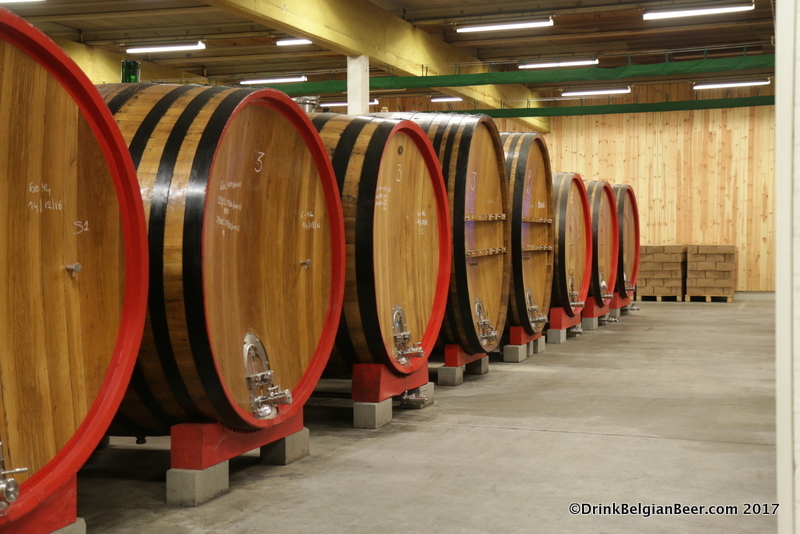 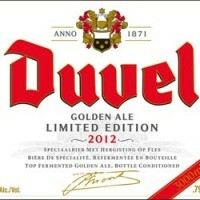 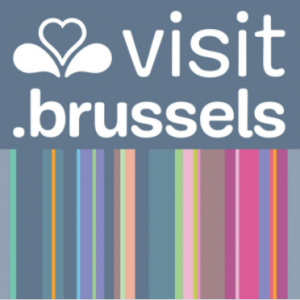 The number “3″ on the barrel indicates it is filled with lambic brewed at 3 Fonteinen. 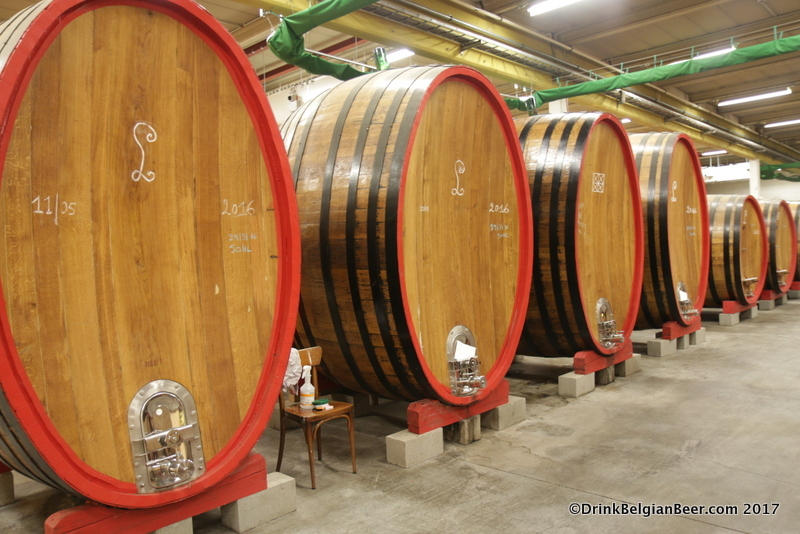 These 10 hectoliter Italian built foeders are filled with cherries macerating with lambic. 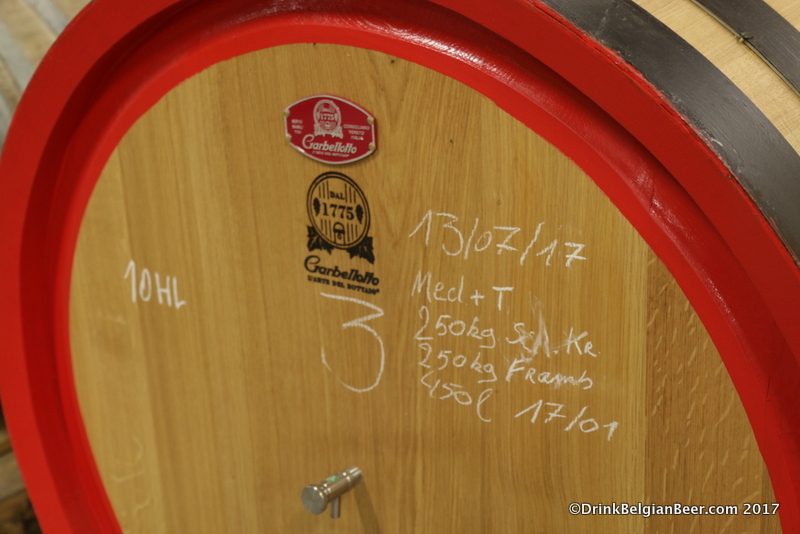 This foeder contains an (apparently experimental) blend of 250 kilograms of Schaarbeekse krieken (cherries) plus 250 kg of raspberries (“Framb”) and 450 liters of lambic brewed at 3 Fonteinen in January 2017. The fruits were added on July 13, 2017. 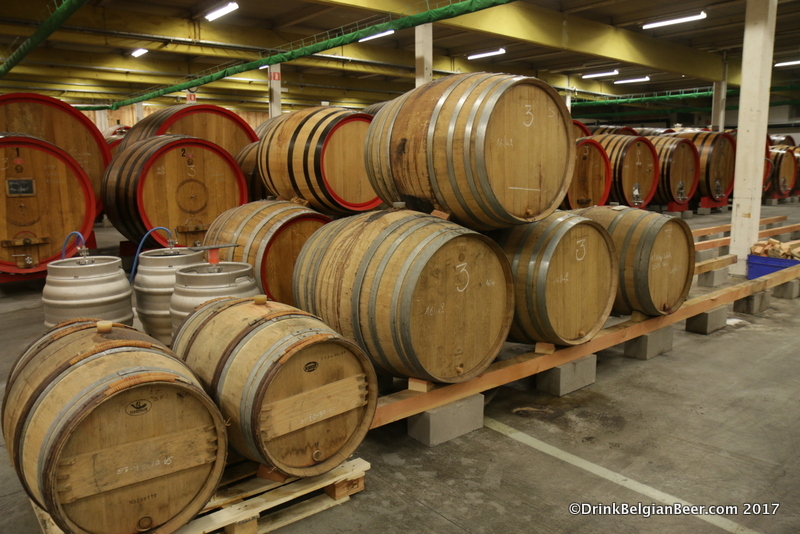 The black banded barrels in this photo contain the next batch of Zenne y Frontera. 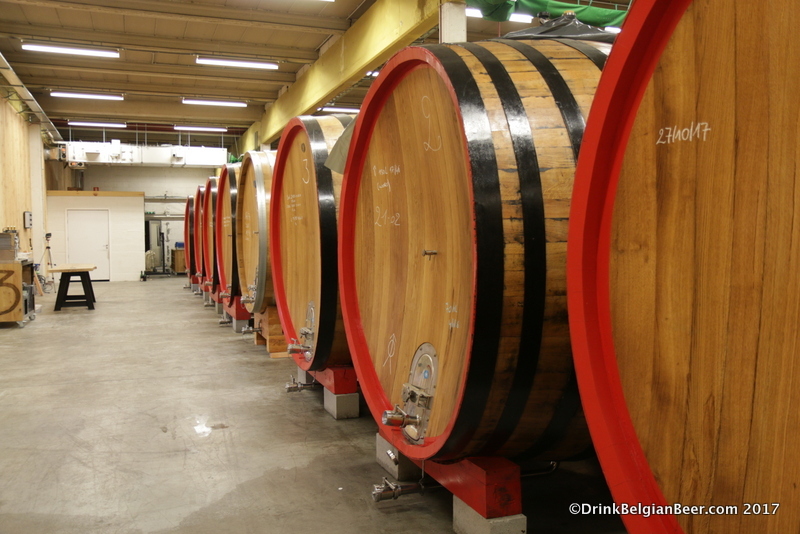 The first two foeders in the foreground are filled with wort produced at Brouwerij Boon. 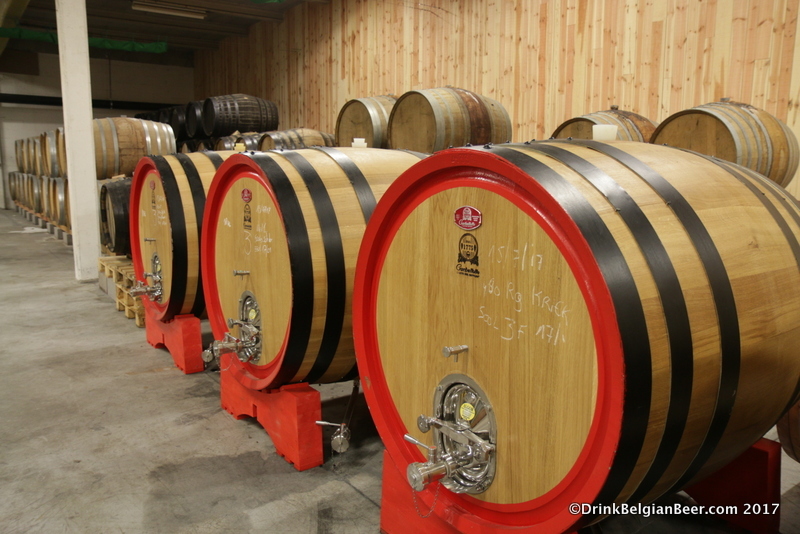 The third foeder from the left contains wort from Brouwerij Lindemans. 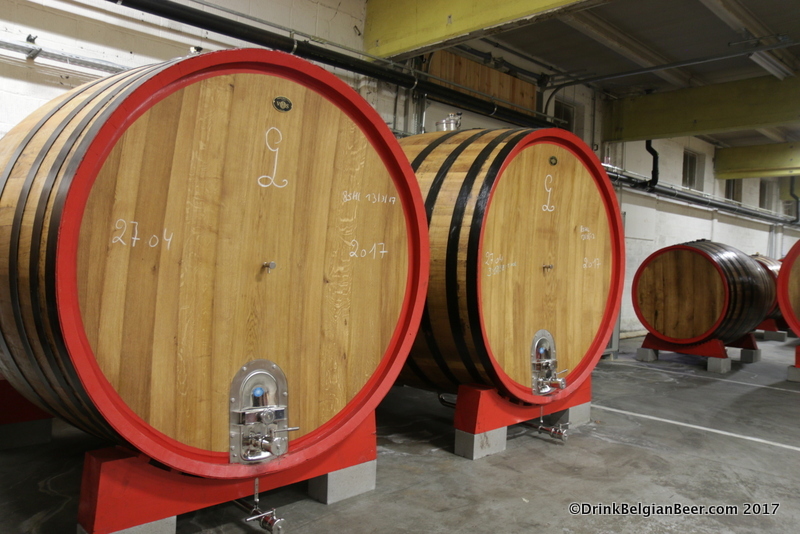 Some smaller barrels in the 400 to 600-liter size, with rows of foeders in the background. 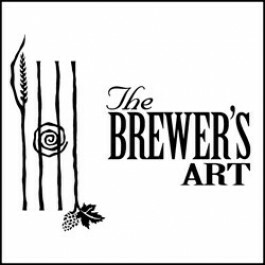 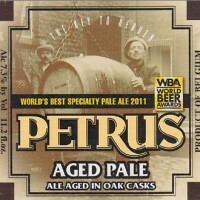 This container of cooler wort, background left, is raised high on a lift so gravity will pull the remaining beer into the foeder. 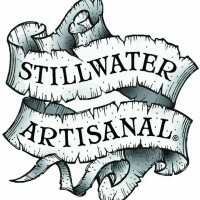 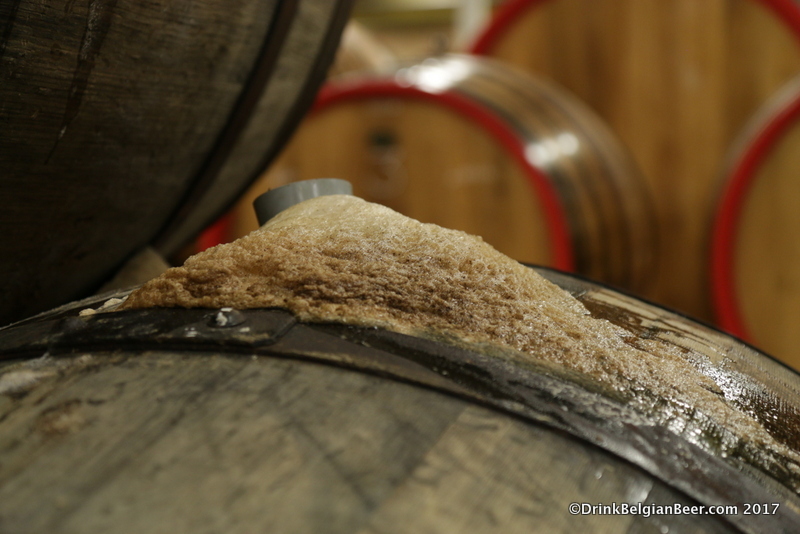 Active fermentation inside a foeder. 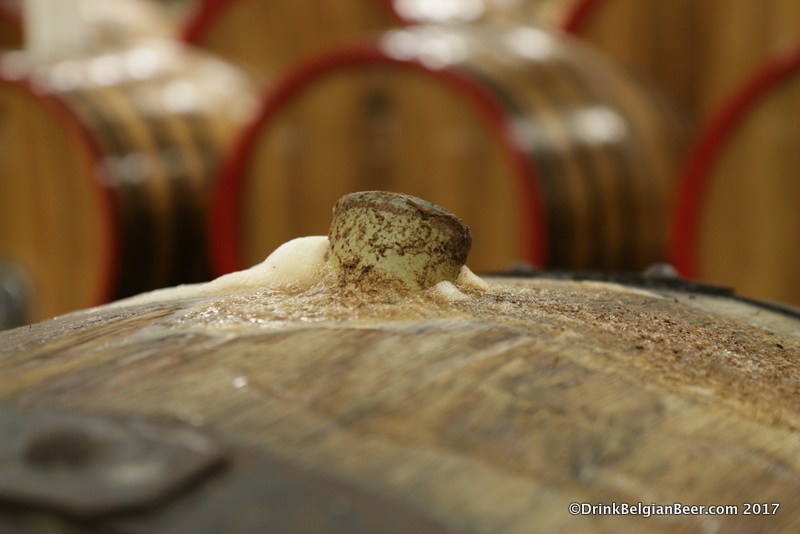 Active fermentation in a 3 Fonteinen barrel. 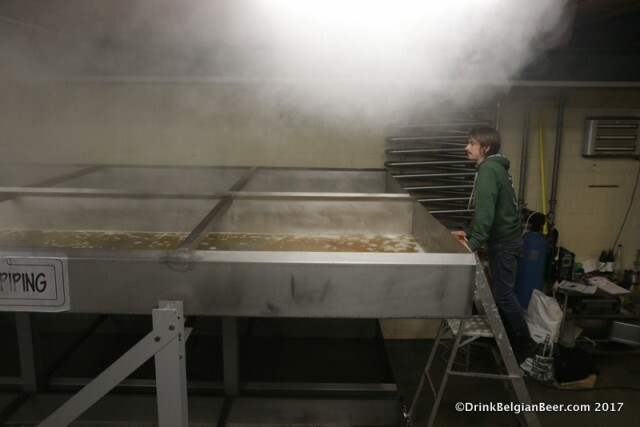 and another example of active fermentation at 3 Fonteinen. 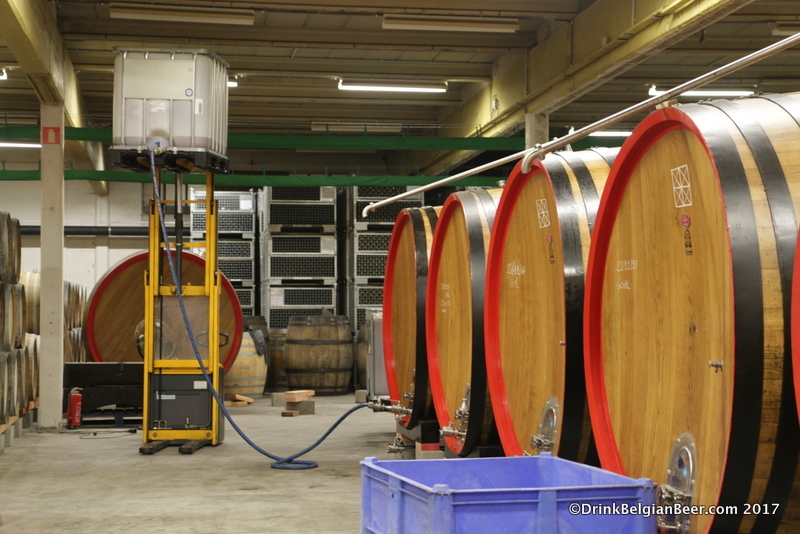 These two large foeders are filled with 85 hectoliters (each) of wort from Brouwerij Boon. 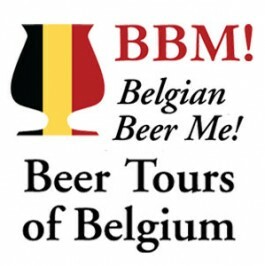 They were filled on March 13, 2017. 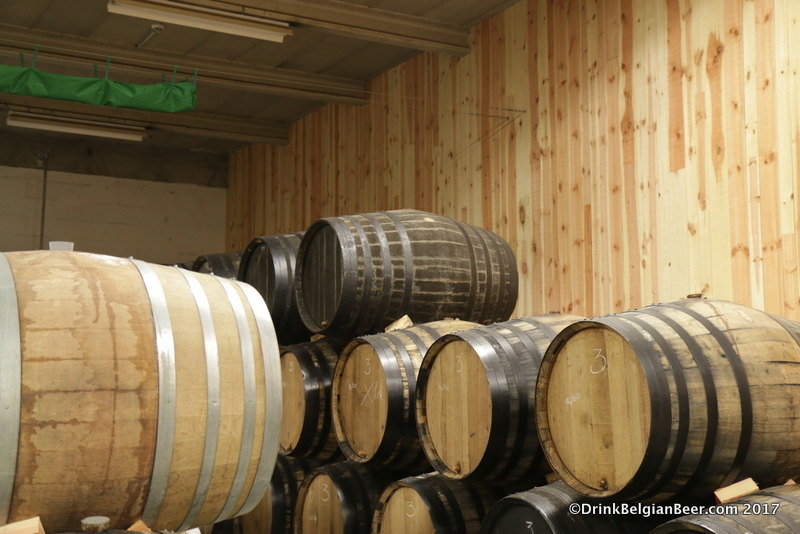 This row of barrels faces the lambik-o-droom cafe. 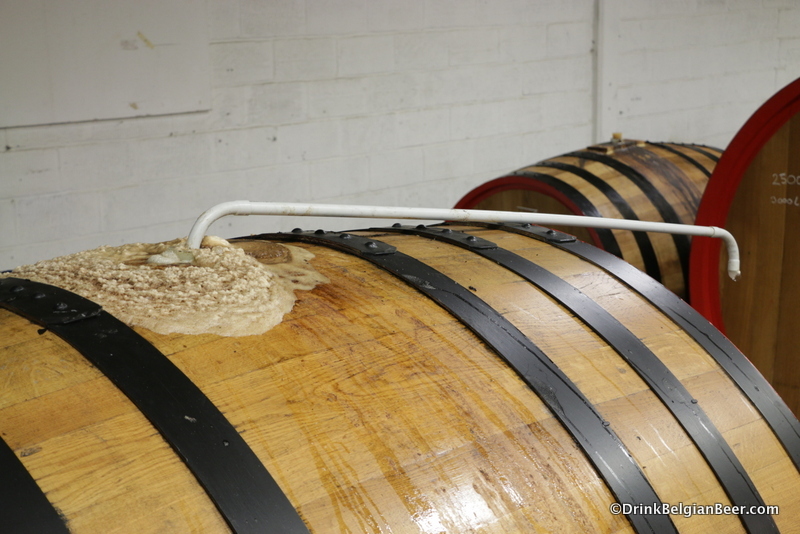 These foeders all contain wort from the 3 Fonteinen coolship in Beersel.